Hi, I am interested in your 1976 Ford Ranchero (stock #5087-CHA) listed on Autotrader for $14,995. I'd like to get more information about this vehicle and confirm its availability. 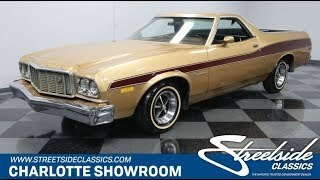 Vintage, correct, and a whole lot of fun, this 1976 Ford Ranchero GT offers you a distinctive classic. After all, with a cool color combo, A/C interior, V8 power, and the overall distinction of a Ranchero, this is the kind of vehicle thats welcomed in any crowd. Fords Ranchero wanted to be both premium and sporty, and that design translates well into this pickup/coupe. Its wide chrome bumpers, angular hood, flared fenders, and a trim line that runs all the way around the bed make this attractive. And mag wheels are always a good look. Plus, the paint is positively interesting. The golden tan with full-length burgundy stripe package painted on top (its on the tailgate, too) has a very 70s-style cool vibe. So while the low price on this Ford leaves room in the budget for a respray, we think it this is already distinct. Plus, while the paint was updated later in life, its survivor-style appearance today is going to have people assuming this is the original application. No matter how you decide to enjoy this Ranchero, it still knows how to keep its useful truck side. Thats why you have liner paint in the bed and a trailer hitch with electric hookup. Inside is a highly original package. The button-top seating has a great style line in the stitching, and it was built to site three comfortably across. But no matter how many people are along for the ride, this one is all about you. The moment you sit down, youll see the driver-oriented dash was a car built to give you total control. The factory dual-spoke steering wheel gives you a clear view at the sporty round gauge package. Within easy reach is everything you want including controls for the factory Philco AM/FM radio and cold-blowing air conditioning running modern R134a. The well-preserved presentation continues under the hood. This one still carries the correct H-code 351 cubic-inch V8. It looks highly authentic with the blue block, valve covers, and air cleaner, and even factory decals are in place. This has the right driving features like power steering, power brakes w/discs up front, and a three-speed automatic transmission. Not only does Ranchero offer a truck body with a car-like ride, but theres also the addition of air shocks in the rear to keep this one ready for work. This classic Ranchero is coming off of long-term family ownership, and its even a Charlotte DSO 22 car. That makes this a cool classic with a great story. So at a price like this, youre looking at an irresistible vintage deal. Call now!